North and South Korea Propose to Hold Talks. DPRK To Participate in Olympic Games? The two Koreas have agreed to hold talks next Tuesday after North Korean leader Kim Jong-un said in a New Year’s speech his country could send a team to the Winter Olympics, due to be held in South Korea next month. Kim also suggested he was open to dialogue to ease tensions on the Korean Peninsula. 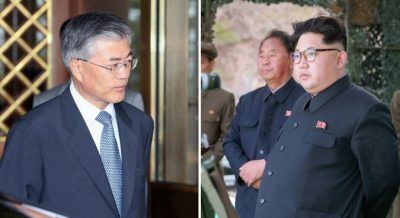 South Korean President Moon Jae-in, who came to power last year advocating dialogue with North Korea, reportedly ordered his staff to act quickly on Kim’s offer. Unification Minister Cho Myoung-gyon proposed a high-level meeting at the border village of Panmunjom for January 9. “We expect to sit down with North Korea face to face and frankly discuss mutual interests aimed at better inter-Korean relations,” Cho said. “We look forward to Pyongyang’s positive reaction to this.” The meeting would be the first between the two Koreas since 2015. The proposal for talks came amid high tensions on the Korean Peninsula after bellicose threats by the Trump administration to “totally destroy” North Korea if it refuses to abandon its nuclear and missile programs. The US has also pressured the UN Security Council to impose harsh sanctions on North Korea that are crippling its economy and generating considerable hardship. He called for talks “as soon as possible” to discuss North Korea’s participation in the Winter Olympics. While adopting a conciliatory tone toward South Korea, Kim warned the Trump administration that the entire US mainland was “within the range of our nuclear weapons and the nuclear button is always on the desk of my office.” This was “not a threat but a reality,” he added. The North Korean leader called for a halt to joint US-South Korean military exercises. Over the past year, these joint drills, which are scarcely concealed rehearsals for war with North Korea, have markedly increased in scale. Last month, the war games included a major air force drill, as well as special forces exercise to practice for a military intervention into North Korea. South Korea’s Unification Minister Cho said the offer of high-level talks with North Korea had been discussed with the US. He added that a decision was pending on whether to delay large-scale joint war games until after the Winter Olympics. China and Russia have previously advocated a halt to the US-South Korean military exercises in return for a freeze on North Korea’s nuclear and missile tests as a means of starting negotiations. The US has repeatedly ruled out any such plan. Moreover, US ambassador to the UN, Nikki Haley, last month suggested on Fox News that the US was considering not sending a team to the Winter Olympics. It was an “open question,” she said, as to whether American athletes would compete, citing security issues. “As we hear reports that North Korea might be preparing for another missile test—I hope that does not happen, but if it does—we must bring even more measures to bear on the North Korea regime,” she said. South Korean President Moon has made clear that his administration would work in close consultation with allies in any talks with North Korea. He stressed that improvements in inter-Korean relations were not separate from “the issue of resolving the North Korean nuclear issue.” In other words, Pyongyang must be compelled to give up its nuclear arsenal. Since coming to office, Moon has followed the US in applying intense pressure on North Korea, including in allowing the full deployment of a US Terminal High Altitude Area Defence (THAAD) anti-missile system. On Sunday, South Korean authorities announced the seizure of a second ship allegedly involved in transferring oil products to North Korea in violation of UN sanctions. Trump’s aggressive confrontation with North Korea has generated sharp divisions in US ruling circles amid fears of a catastrophic war. In a high-profile interview on ABC’s “This Week” program on Sunday, former Joint Chiefs of Staff chairman Admiral Mike Mullen gave a scathing assessment of Trump’s foreign policy over the past year. Mullen declared it had been “incredibly disruptive, certainly unpredictable in many, many ways” to established relationships and alliances in the post-World War II period. The standoff between the US and North Korea is rapidly coming to a head. Trump has insisted since coming to office that he will not tolerate North Korea having the ability to strike continental United States with a nuclear weapon. Trump officials have repeatedly warned that time is running out for any peaceful resolution. At the same time, North Korea has declared time and again that it will not give up its nuclear weapons without security guarantees from the United States. It is in this context that the two Koreas plan to meet next week. Featured image is from KCNA.